(Francisco Kjolseth | The Salt Lake Tribune) A small crew at the Salt Lake City International Airport has been busy growing 1500 poinsettias for the holiday season. Starting Sunday airport staff will start to distribute the various breeds grown from small plugs to decorate the terminals for Christmas. (Francisco Kjolseth | The Salt Lake Tribune) Dave Tingey, Senior Airport Grounds and Pavement Supervisor at Salt Lake City International Airport tours the greenhouse near the control tower where they grow 1500 poinsettias for the holiday season. Starting Sunday staff will start to distribute the various breeds grown from small plugs to decorate the terminals for Christmas. (Francisco Kjolseth | The Salt Lake Tribune) An egg plant sits amongst the poinsettias to help draw away any white flies that might be present amongst the colorful plants acting as a natural pest control companion at the Salt Lake City International Airport greenhouse where 1500 poinsettias have been grown for the holiday season. 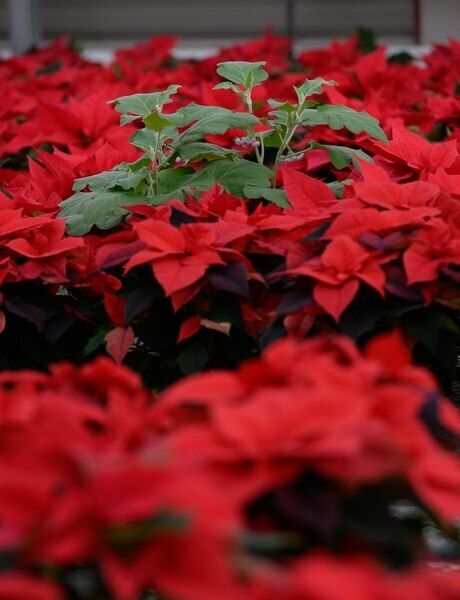 (Francisco Kjolseth | The Salt Lake Tribune) Dave Tingey, Senior Airport Grounds and Pavement Supervisor at Salt Lake City International Airport tours the greenhouse near the control tower where they grow 1500 poinsettias for the holiday season. Starting Sunday staff will start to distribute the various breeds grown from small plugs to decorate the terminals for Christmas. (Francisco Kjolseth | The Salt Lake Tribune) Dave Tingey, Senior Airport Grounds and Pavement Supervisor at Salt Lake City International Airport tours the greenhouse near the control tower where they grow 1500 poinsettias for the holiday season. Starting Sunday staff will start to distribute the various breeds grown from small plugs to decorate the terminals for Christmas. (Francisco Kjolseth | The Salt Lake Tribune) An egg plant sits amongst the poinsettias to help draw away any white flies that might be present amongst the colorful plants acting as a natural pest control companion at the Salt Lake City International Airport greenhouse where 1500 poinsettias have been grown for the holiday season. (Francisco Kjolseth | The Salt Lake Tribune) A small crew at the Salt Lake City International Airport has been busy growing 1500 poinsettias for the holiday season. Starting Sunday airport staff will start to distribute the various breeds grown from small plugs to decorate the terminals for Christmas. (Francisco Kjolseth | The Salt Lake Tribune) A small crew at the Salt Lake City International Airport has been busy growing 1500 poinsettias for the holiday season. Starting Sunday airport staff will start to distribute the various breeds grown from small plugs to decorate the terminals for Christmas. (Francisco Kjolseth | The Salt Lake Tribune) A small crew at the Salt Lake City International Airport has been busy growing 1500 poinsettias for the holiday season. Starting Sunday airport staff will start to distribute the various breeds grown from small plugs to decorate the terminals for Christmas. 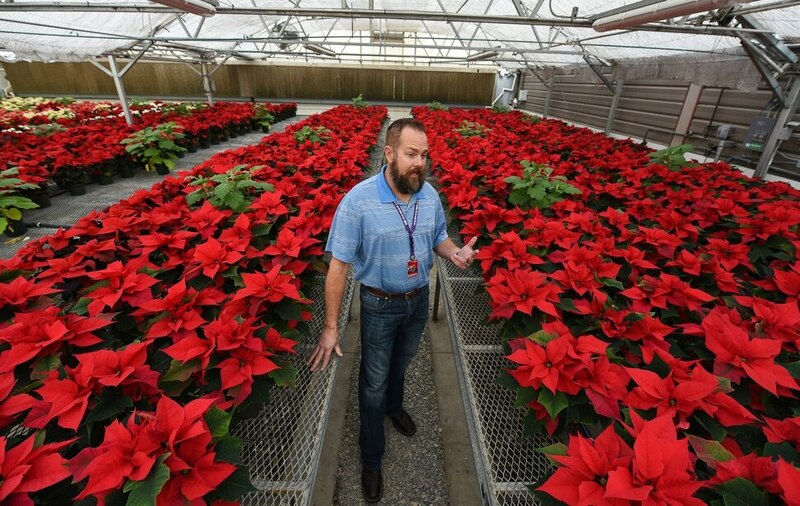 (Francisco Kjolseth | The Salt Lake Tribune) Dave Tingey, Senior Airport Grounds and Pavement Supervisor at Salt Lake City International Airport tours the greenhouse near the control tower where they grow 1500 poinsettias for the holiday season. Starting Sunday staff will start to distribute the various breeds grown from small plugs to decorate the terminals for Christmas. (Francisco Kjolseth | The Salt Lake Tribune) A small crew at the Salt Lake City International Airport has been busy growing 1500 poinsettias for the holiday season. Starting Sunday airport staff will start to distribute the various breeds grown from small plugs to decorate the terminals for Christmas. One might expect to find warehouses and large equipment near Salt Lake City International Airport’s imposing air traffic control tower. 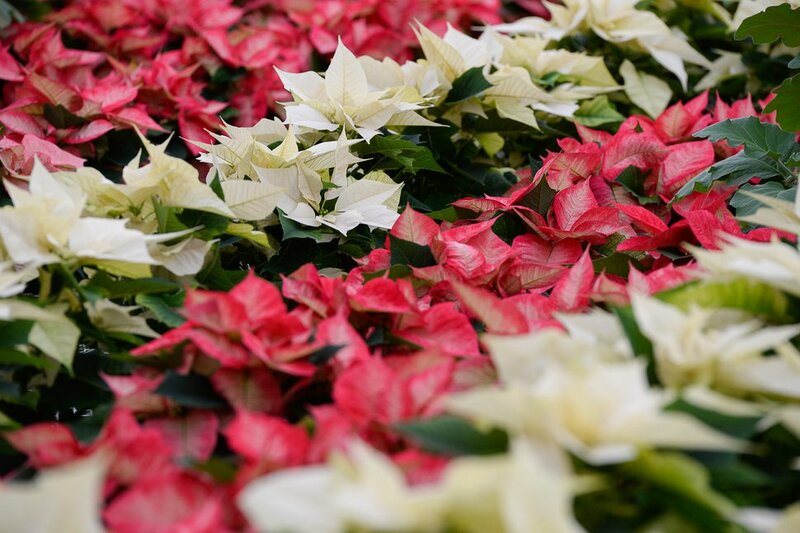 But a greenhouse filled with 1,500 red, pink, white and cream-colored poinsettias? "It’s pretty unique,” explained Dave Tingey, a senior grounds and pavement supervisor. For more than 20 years, the airport’s maintenance division has had its own greenhouse — at the base of the Federal Aviation Administration tower on the north side of the airfield — where it grows a variety of plants for outdoor landscaping and indoor decorating. Growing its own plants saves the airport money, said Tingey, who estimates that the poinsettias cost Salt Lake City $2 each, much less than if it purchased them from a commercial grower. The poinsettias are a yearlong endeavor, said Tingey, who places the airport’s Christmas flower order in January, receives the small seedlings in August and then has crews plant them in plastic pots. Over the next three months, they are meticulously cared for in the temperature-controlled greenhouse with minimal insecticides. For example, eggplant seedlings are grown among the poinsettias to keep white flies in check. By the weekend after Thanksgiving, the plants have bloomed and are ready to move into the terminals to greet visitors arriving and leaving during the holiday season. Tingey said the employees who place the delicate plants are the same ones who operate the giant snowplows that clear the runways during winter storms. 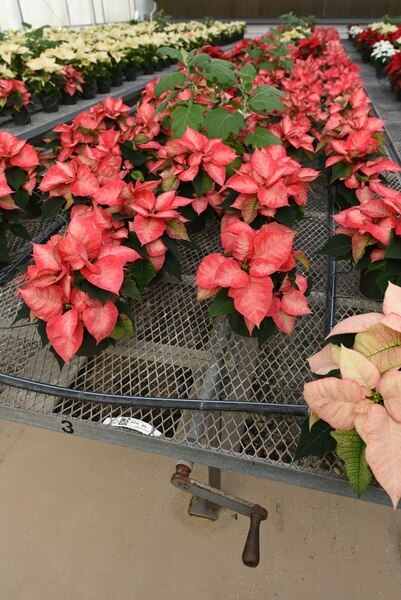 “We’re always in the holiday spirit,” said Tingey, who noted this year crews have grown poinsettias in four colorful varieties — with names like Enduring Red and Princettia Pure White. (Francisco Kjolseth | The Salt Lake Tribune) A small crew at the Salt Lake City International Airport has been busy growing 1,500 poinsettias for the holiday season. Starting Sunday, airport staff will start to distribute the various breeds grown from small plugs to decorate the terminals for Christmas. Once they are in the terminals, placed on counters or around artificial trees, the fragile plants need constant care. "You can’t let them dry out,” Tingey said, noting that the Christmas flowers often take a beating. Busy travelers have been known to step on them or hit them with their luggage. While the airport is undergoing a multibillion-dollar overhaul, there are no plans to expand the greenhouse, said Tingey. Instead, the airport has bought a new 35-foot-tall artificial Christmas tree and nearly 40 nutcrackers — some standing 12 feet tall — that will be used in the new concourses, which are expected to open in 2020. It’s all about creating a welcoming ambience for today’s savvy travelers, he said. Even for frustrated fliers — flowers can do that.